economic misery | What's that you said? The United States experienced two major economic crises over the past century — the Great Depression starting in 1929 and the Great Recession starting in 2007. 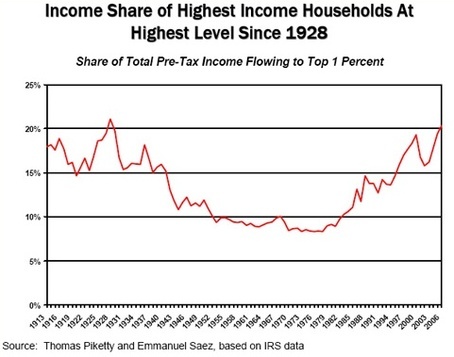 Both were preceded by a sharp increase in income and wealth inequality, and by a similarly sharp increase in debt-to-income ratios among lower- and middle-income households. When those debt-to-income ratios started to be perceived as unsustainable, it became a trigger for the crisis. Following Beck Into The Heartland Digby highlights a recent BagNewsBlog post about Glenn Beck’s planned celebration in a town devastated by the current economic turn down — lionizing these folks as the sturdy independent sort who do just fine without Washington’s handouts — whereas the folks themselves are simply hoping to benefit from the jobs and tourism to be had from this event. Many seem to not even know who the heck Beck is. Glenn Beck and his entourage will descend on the small town of Wilmington, Ohio, to tape his radio show, sell books, and perform in an extravaganza that he calls “America’s First Christmas.” He chose Wilmington because it is hard hit by the recession, with 8000 jobs lost when the main employer in the area, DHL, closed its facility in 2008. He claims that the people here neither want nor accept government help, saving themselves through prayer and self-reliance. But this is completely untrue, as more than $11 million dollars of federal stimulus money was specifically directed to retrain unemployed workers and alleviate the dire economic situation. [The] key lesson to take from all of this is that simply railing against income inequality doesn’t get us very far. We have to find a way to prevent or limit major banks from repeatedly going short on volatility at social expense. No one has figured out how to do that yet. It remains to be seen whether the new financial regulation bill signed into law this past summer will help. The bill does have positive features. First, it forces banks to put up more of their own capital, and thus shareholders will have more skin in the game, inducing them to curtail their risky investments. Second, it also limits the trading activities of banks, although to a currently undetermined extent (many key decisions were kicked into the hands of future regulators). Third, the new “resolution authority” allows financial regulators to impose selective losses, for instance, to punish bondholders if they wish. But he then also dismisses tighter regulation on the banks, arguing that the banks know far more about what’s going than the government possibly could. In particular, he ignores the fact that regulation worked quite well — up and until they were dismantled or repealed. I’ve got to say, I’m not really convinced, here. You’ll notice the peak inequality years are 1928 and 2007, which suggests a link between income inequality and economic instability. And there’s a long historic link between wealth inequality and political instability as well. Cowen seems to think that the issue of inequality is that people are envious of those who have more stuff than they do. I don’t think that’s it at all. I do not think most not-rich people begrudge the rich and their cushier lives. The issue is that increasing numbers of middle-class Americans feel their own financial situations are being whittled away, and the ground beneath their feet shifting treacherously, and no one in power seems to care. The issue is that the economic system has been rigged so that most of us can no longer get ahead, no matter how hard we work. Which takes us back to expectations. Most people will endure hardship and deprivation if they see a road away from hardship and deprivation. In other words, most people don’t spin their wheels in envy of wealthier people if there’s a real possibility they could be wealthier themselves someday. Go read both of these. Washington is busily separating the two economies even further. It’s extending the Bush tax cuts – the lion’s share of which go to the very wealthy; reducing the reach and rate of the estate tax; and giving corporations additional tax breaks for investing in software and equipment. Meanwhile, the states are cutting back on pre-schools, firing teachers, and yanking up tuitions and fees at public universities. At yesterday’s education budget meeting in Los Angeles, educators from across the state took to the microphone to tell Governor-elect Jerry Brown that schools cannot accept more funding cuts without the system collapsing. And Brown, along with Treasurer Bill Lockyer and other state officials, explained that while they understood full well that California’s schools have already been cut to the bone and are funded worse than in almost every other state, there’s not going to be any avoiding those cuts – unless new revenues are approved. Calitics is increasingly of the opinion that Jerry Brown is planning on a grand game of chicken with the California public to force new taxes in order to start repairing the state. It is a hugely risky approach, not the least of which is getting past that 2/3’s voting for a tax increase, but it may be his only option, like it or not. Some of the updates since I first read this article have been extremely interesting — including how the Democrats could do an end-run around the Republicans on the matter of voting it in. This entry was posted in news and tagged economy, great recession, tax cuts. Bookmark the permalink.